There are times when there is no doubt that you should tell someone that they’re not properly equipped for a day in the mountains and should turn back. One example of this happened earlier this month when a stag party attempted to climb Snowdon dressed in pyjamas and trainers, in a storm and by the scrambling route of Crib Goch. Unsurprisingly, this stag party got into trouble and had to be talked down by phone by mountain rescue. A back-clipped quickdraw; a potentially dangerous mistake that is a little too easy to make and to not notice. Would you point this mistake out to someone you didn’t know? Rock climbing guide books are an invaluable resource and are essential to ensure that you don’t end up climbing the wrong route or no route at all (both of which can be scary and/or dangerous). Unfortunately, the features of the routes that guide books describe do sometimes change. The route descriptions in the books also need to be quite brief and this lack of detail can sometimes lead to you being surprised by some aspect of a route. For these reasons, I am starting a regular series of posts on “what they don’t tell you in the guide book.” The first such post is about Craig yr Aderyn. 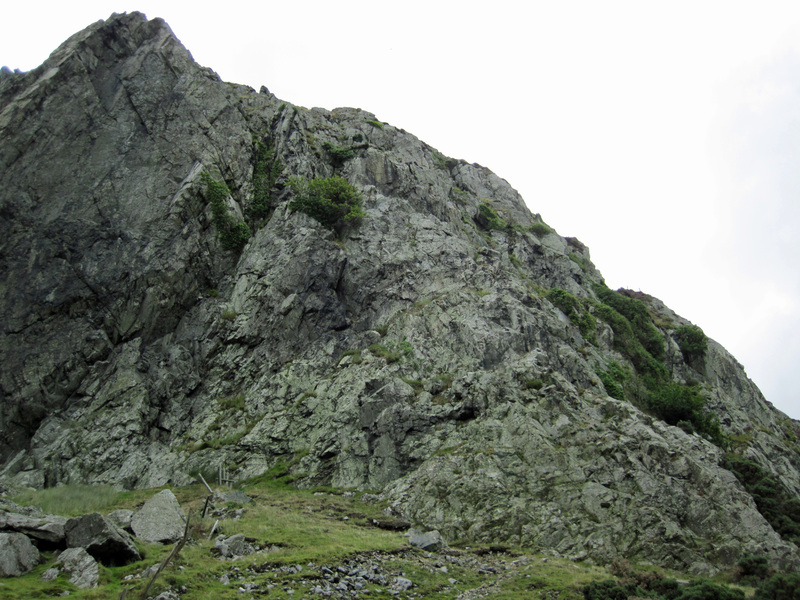 The Bastion face on Craig yr Aderyn. The route The Buttress runs diagonally up from the bottom right of the face.